Cash Prizes and Trophies awaits the ten most outstanding art works. The Trophies are sculptures of the renowned Filipino artist Aris Bagtas. The entries will be judged based on the following criteria: 1) Content and Originality, art work’s relevance to the theme and the originality of artist’s concept; 2) Technique and Creativity, Artist’s talent and mastery of the medium; and 3) Overall Impact – overall impression and composition of the art work. 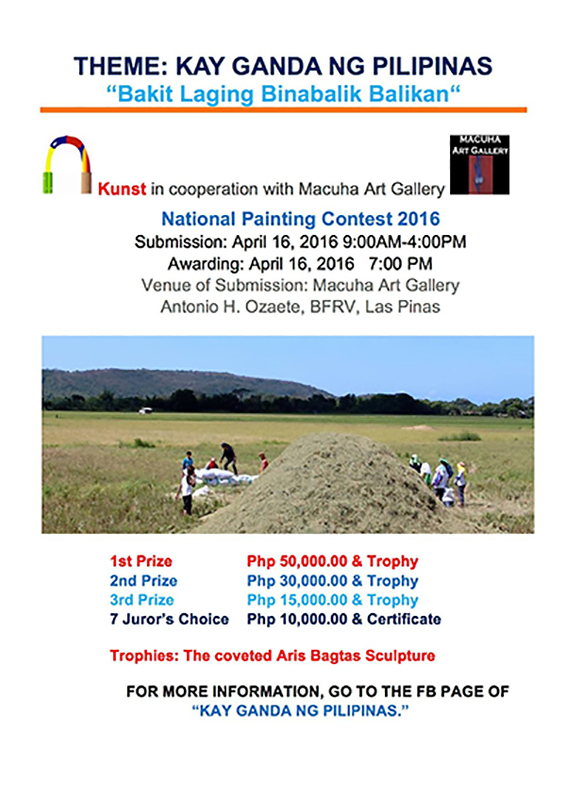 Interested artists are advised to join the Facebook Page “Kay Ganda ng Pilipinas Painting Contest 2016”. Here the artist could download all the information such as Mechanics, Entry Form and the Affidavit of Joining the contest. Macuha Art Gallery aims to promote the Philippine Contemporary Arts and the Filipino Artists. Mabuhay ang Macuha Art Gallery! magandang pagkakataon eto sa mga na naghahangad ng pangalan sa larangan ng sining…MABUHAY MACUHA GALLERY!!! May mga requirement po b Kung magus submit ng entry? Katulad ng BC, picture ect.? For the Mechanics of the Painting Contest, please join the Facebook Group “Kay Ganda ng Pilipinas Painting Contest” and go the Info Tab, then Files Tab and download the Mechanics, Entry Form and the Affidavit of Joining.